Size (Diameter x Depth): 1" x 0.75"
1" x 0.5" 1" x 0.625"
Edge grip style stand offs display signs up to 1/4" thick. 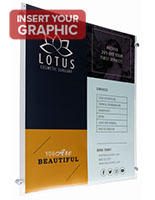 Satin aluminum finish create sleek, modern looking signage. Allen wrench for mounting stand offs securely. 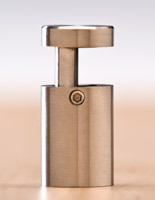 This standoff comes as a set of (4) fasteners that hold a display sign panel 3/4" from the wall. Wall sign mounting is easy with this style support. 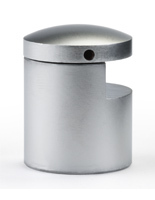 This 1" diameter standoff, also known as a display mount, does not require holes to be drilled in the sign substrate. The fasteners can hold signs from 3/16" to 9/32" thick. 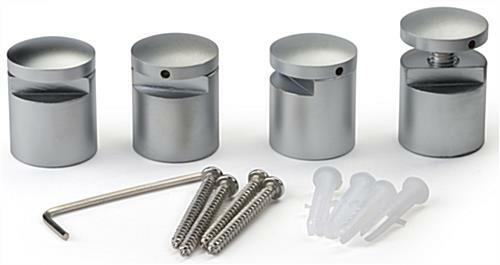 This wall mount system, standoff set is easy to use and includes all hardware needed for installation. Installing a sign is a simple matter of attaching the mounts to the wall. 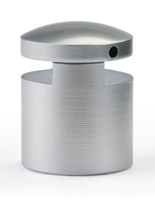 Each standoff cap is inserted around the display panel and inserted into the fasteners. Tighten the endcaps using the included allen wrench and the wall mount is ready for display. 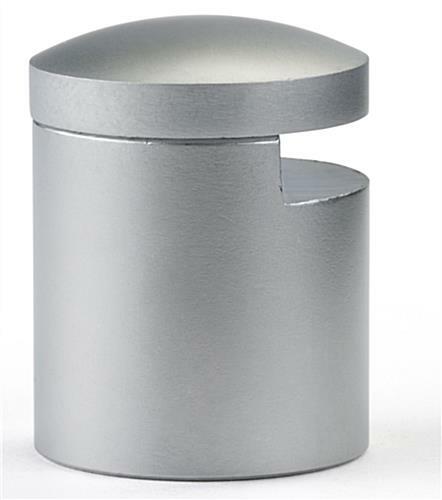 This attractive satin finish edge grip standoff will create an attractive mount that does not obscure messaging or images. Wall mount signs create an eye-catching display in any location. A system that holds signage at a distance from a wall, such as this standoff, creates a support with a 3D look. 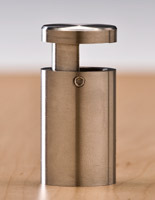 The neutral satin aluminum finish will complement any decor. 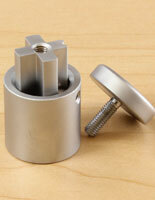 This standoff set for wall mount includes four fasteners that can be used with almost any sign material. Signs using this type of support are frequently seen in offices, lobbies, convention centers and educational institutions as room or office markers. 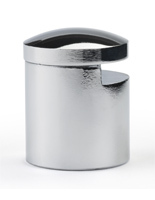 This economical aluminum standoff will create an elegant display with a modern look. Because each of these fasteners is designed to hold a sign by the edges, lettering or logos will not be obscured. Many businesses also choose this type of standoff as a holder for shelving, in addition to signage. Please Note: Each of these sets includes (4) standoffs for (1) sign.